Here's the dilemma: whether to cover your face with a respirator, feel claustrophobic and risk 'Daft Vader' cracks from your mates, or to look and feel cooler in an ordinary mask and risk inhaling fine and possibly toxic dust along with assault by flying wood chips. Not so much of a dilemma after all, put like that. own personal comfort zone. I have to admit that, while I wear a respirator for safety's sake, up till now I have never relished the prospect of donning it. 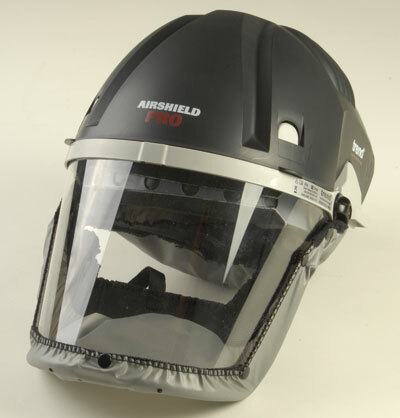 I own - and use - the Airshield model that the 230V Air/Pro Airshield Pro Respirator replaces, so am I going to get a positive wearing experience from this new one? I'm looking for comfort, health and efficiency at a reasonable price. 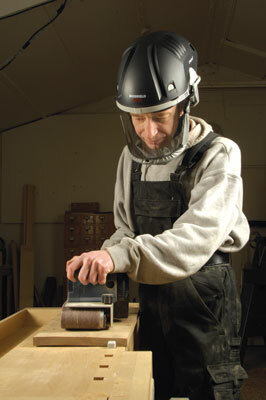 With the battery, motor, face shield and head guard sitting effectively on top of your head, the old-style respirators, like the last Airshield, could cause such neck ache and claustrophobia that after a couple of hours I always felt like removing it and abandoning the job. But this new Airshield is light years away from its predecessor. The balance is better, I was able to work for four hours without neck fatigue, it feels as if there's more space inside and as if more air is blowing across the face. It's a massive improvement and one of the least expensive respirators available today. "It is a massive improvement and one of the least expensive respirators available today"
Contact: Trend Machinery and Cutting Tools Ltd.